The 1931 Asbestos Industry Regulations were designed to protect the safety of workers in the Asbestos Industry and factories from the risks to health from working with asbestos. The Regulations required that there was a mechanical exhaust to prevent the escape of asbestos dust into the air of any workplace. They also required that all floors and plants should be kept in a clean state and free from asbestos debris. 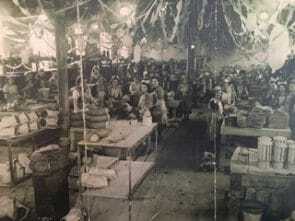 h Uralite factory at Higham in Kent (pictured left) gather around their work benches at Christmas approximately 25 years after the Regulations came into effect. They mixed asbestos fibre with water to mould chimney covers, asbestos pipes and gutters by hand. There was no dust extraction. They were not provided with masks. They were stood on duckboards because of the asbestos dust on the floor.